I turned sixty years old today and everyone is asking me how it feels to be sixty. To be honest, it feels exactly the same as it felt to be fifty-nine - which is essentially the same as it felt to be 40. Nothing has changed. And speaking of nothing changing, nothing has changed over at BigBrains where two updates have come my way. The first came from someone who knows the real identity of BigBrains and suggested that I refer to them as ShitForBrains instead. She must have met them! The second update came from the OMG Partner who is working with BigBrains. His email was a riot and even though he is very frustrated with their inability to make smart decisions, he sees the humor in all of this too. He signed off with, "Some people have to cut off their nose to spite their face. &^%$# amazing!" If you haven't read the prior posts about BigBrains, Benchmarking, our Perfect Fit Analysis, and their reasons for being so stupid, this post has links to each of the other articles. BigBrains is finally using our Sales Candidate Assessment, and instead of hiring business development reps, the subject of 6 previous posts, they are using it to hire salespeople. 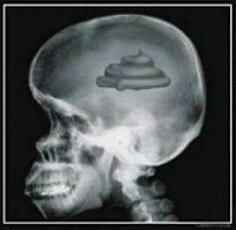 There is still a problem though... BigBrains is interviewing first (wasting lots of time and money) and assessing later. So of course, when they assess their final candidates, the assessment results are coming back as not recommended and they can't understand why. LESSON #1: You will never be able to determine from an interview whether a candidate possesses enough Desire and Commitment for success in sales, whether their Sales DNA is strong enough to succeed in support this skills, and whether they have the sales capabilities to get the job done. LESSON #2: You must assess candidates at the earliest stage of the recruiting process to filter out those who won't succeed in the role and identify those candidates with whom you should spend your time talking. LESSON #3: Some of the candidates that you choose to not include in the process should be included because their sales capabilities make up for whatever it is that you don't like about their resume. Some of the candidates that you choose to include in the process should not be because their sales capabilities are not consistent with what you liked about their resume. LESSON #4: If you interview prior to the assessment, you will fall in love with your candidates and then, if the candidate is not recommended, tend to dismiss the assessment results because they differ from what your heart is telling you. Assess first and you will only be able to fall in love with quality candidates, and, perhaps of greater importance, be EEOC Compliant. When using assessments, all candidates must be assessed. LESSON #5: Nobody, regardless of how long they have been interviewing and hiring salespeople, is smarter than OMG's Sales Candidate Assessments. You just can't beat the track record, predictive accuracy and uncanny insights. Lack of significant change as your age increases is a good thing. Lack of change when you're attempting to get sales hiring right is not. 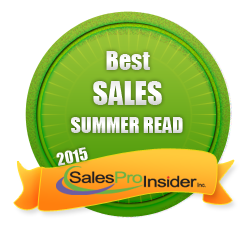 Did You Know That There is a Season for Hiring Salespeople? I live in the Boston area and there are some things that I know will always be true about the seasons. School buses start rolling in September, fall foliage peaks in October, the first freezing cold days arrive in late November, snow storms are routine by mid-December, the coldest, driest days are in January, the snowiest month is in February, the days begin to get longer in March, the snow has melted so that baseball can be played in April, flowers blossom and leaves appear on the trees in May, summer weather arrives for good in mid-June, it turns as hot as the fireworks in July and the weeds thrive and attempt to choke out the plants in August. Did you know that when it comes to hiring salespeople, there are also seasonal trends we know to be true ? It's as certain as the ice storm we seem to get every year right around the New Year. 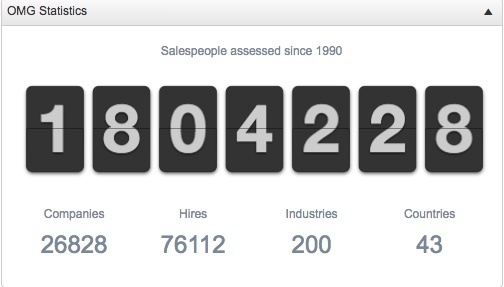 The first graph below is a running total of the number of sales candidates assessed since 2009. Beyond the obvious trend towards more, which has more to do with Objective Management Group (OMG) than hiring, you should be able to notice the many peaks and valleys. If we look at the same data in a different way, those peaks and valleys will make more sense. In the next graph we separated the data by year (the different colors represent the years 2009 - 2015) and month (1-12). 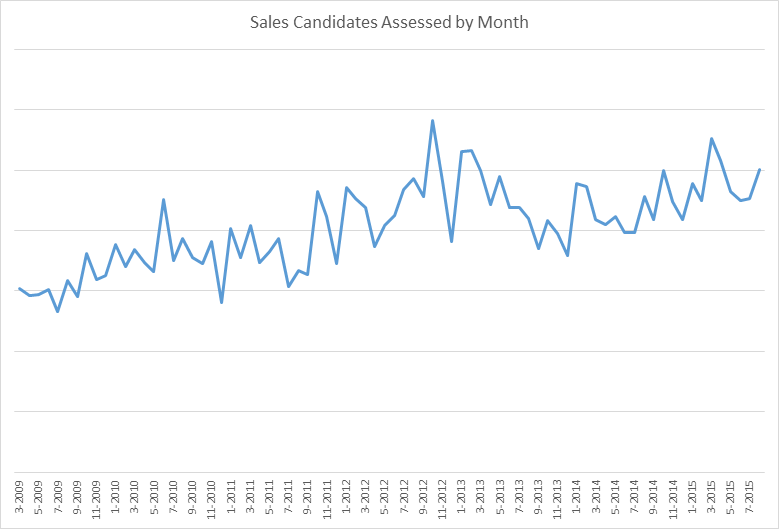 If you look closely, you can see that March and October are the seasons for hiring salespeople! You can also see a few other things that are reflective of conditions in the economy. Note how the peaks did not occur in 2010, because the economic recovery had not yet kicked in. 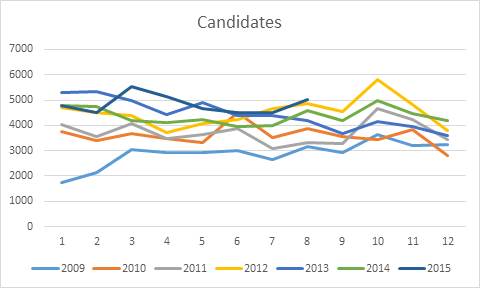 And note how with the exception of March, the number of candidates is down in 2015. This is not about OMG, but it is about the current shortage of sales candidates. On first blush, it's easy to mistakenly believe that more candidates are looking to change jobs during March and October. But the reality is that more companies hire salespeople in the last first and last quarters. How do I know? OMG has an uptick in licenses and subscriptions sold during March and October. So, if we are closing in on October and most companies hire salespeople in October, shouldn't you be thinking about doing that too? What's that? You don't need any salespeople? Are you sure? When 50% of salespeople don't make quota and 30% of salespeople can't be trained, some simple math would suggest that 15% of your sales force should be replaced each year. Perhaps it's time to replace your worst performer(s). It's also important to see that you will have less competition for those candidates if you hire in July, September, and the Winter months. If you don't already use OMG to get sales selection right, this would be a great time to start! Plans start at just $99 per month and you can use this link to learn more and subscribe. One topic that never gets stale is how to make sure that you nail sales selection. Whether or not salespeople actually fail, or they simply stick around, but fail to have an impact, the common theme is still failure to select the right salespeople. Recently, I stumbled upon this article about 3 Uncoachable Sales Attributes that you should focus on to get hiring right. The author is correct in that the 3 attributes she chose to write about are not really coachable. However, it seemed she meant to imply that by hiring salespeople with these 3 attributes, you'll get hiring right. While those 3 attributes may be good ones to focus on for the general employee candidate pool, she is way off base with that approach for hiring salespeople. Let's discuss the many ways where this approach goes off the tracks. At Objective Management Group (OMG), we are always conducting analyses between top and bottom sales performers, and I can tell you that when someone veers away from the data and begins to compare personality and/or behavioral styles, there is typicially no difference between the top and bottom performers. The author identified Drive as one of her big three and she defined it as having motivation and competitiveness. OMG measures motivation, and both top and bottom performers usually appear to be equally motivated. 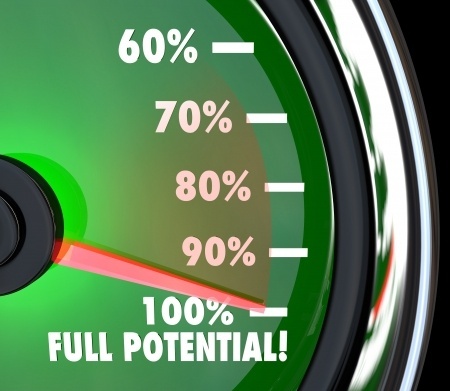 OMG measures Desire - how badly a salesperson wants to achieve greater success in their sales role. OMG also measures Commitment - their willingness to do whatever it takes to achieve that success. Together, they form a very strong representation of competetiveness. Guess what? There isn't much of a difference between top and bottom performers with these findings either. However, we never recommend that a company hire a salesperson lacking in either one. The author identified Brains. There is a difference here...but it's not about brains. It's about one's ability to quickly figure things out. 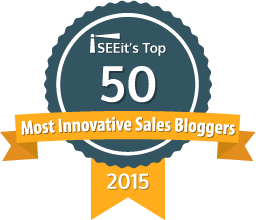 One doesn't have to be smart to succeed in sales, but they do need problem solving ability. We call it the Figure it Out Factor (FIOF) and it comes into play during ramp-up time. Those with scores above 74 ramp up significantly more quickly than those with scores below 60. The author identified character as her third attribute. Really? Do you really believe that someone who struggles in sales is lacking in character? There is zero difference. Perhaps a better choice of attributes would have been tenacity, resiliance or mental toughness. There is a huge difference though, in the areas she did not identify. At OMG, we measure several Selling Comptencies (Hunting, Consultative Selling, Qualifying, Presenting, Closing, Positioning, Account Management and Farming) that each include dozens of findings (sales-specific strategies, tactics and qualities) that do allow us to differentiate between the top and bottom performers in sales. We also measure several areas of Sales DNA (strengths that support the use of sales process, sales methodology and sales competencies) that further help us differentiate between top and bottom performers. The author named three attributes that she believed made a difference. How many attributes or findings does it really take to differentiate the sales candidates that will succeed from those who won't? A lot. At OMG, we utilize more than 500,000 combinations of findings to arrive at our highly accurate and predictive recommendations as to whether various candidates will succeed in the various roles for which companies are hiring. 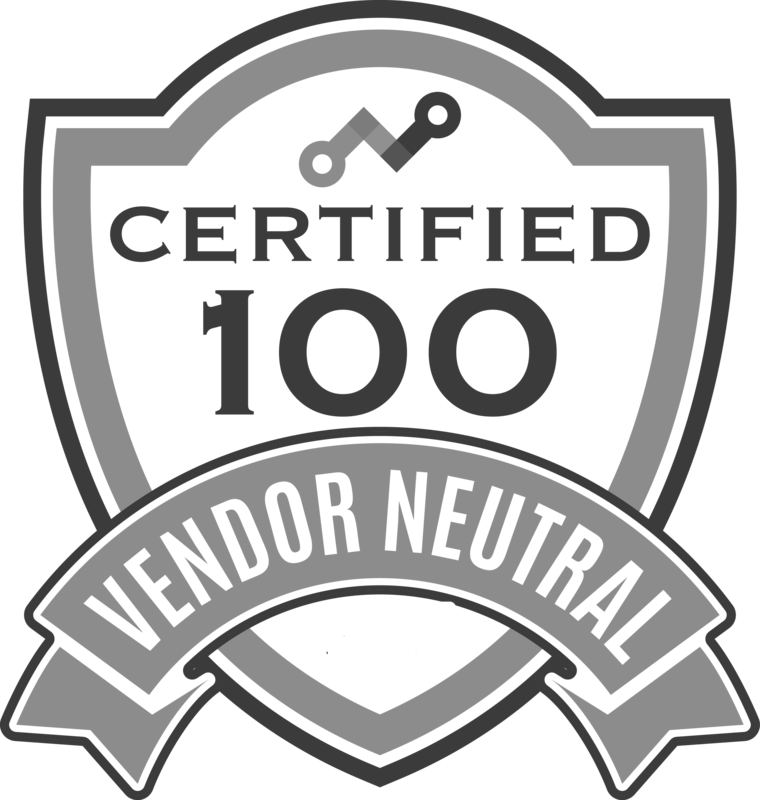 There are a lot of people who think they have the ability to consistently identify sales winners. How can one differentiate between all of them who think that way and other assessment companies that claim to have that capability? OMG has science on its side and it's the science that helps us to consistently get it right. 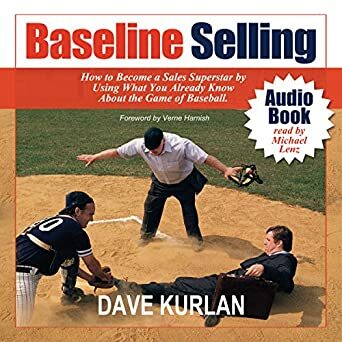 Most Sales VP's, sales managers, and even sales authors, trainers and coaches, aren't necessarily experts when it comes to sales selection. Neither are recruiters. Who and what can you depend on? Rely on sales-specific tools that are backed by science, use them in a sales-specific, Top-Grading-like recruiting process, and you can't go wrong. The Harvard Business Review finally published a relevant article that I agreed with! Yeah HBR. Much too frequently, their articles on selling are written by out-of-touch researchers with little field experience and lots of theories. 21st Century Talent Spotting points to coming talent shortage and the importance of hiring for potential. The article also instructs readers to evaluate using a predictive tool. Resumes tell you where a candidate has been, how long they stayed, and what they did. References verify that information. Interviews spotlight the candidate's presence, show their ability to make first impressions, present, and answer questions. Track records represent their past performance. With all of that information about their past, how can you possibly gauge potential when hiring for your sales force? Objective Management Group (OMG) has three candidate assessments that provide companies with exactly that for sales, sales management, and sales leadership (VP/Sales Director). While personality and behavioral styles tests tell you about a candidate's make-up, OMG's assessments tell you about their Sales DNA, Sales Competencies, Will to Sell (Desire, Commitment, Motivation), and Potential. Yes, potential. Make-up is nice to have. DNA, Competencies, Will to Sell and Potential are must-haves. OMG is uniquely able to determine and accurately predict whether or not a candidate's combination of will, competencies, and DNA will allow them to succeed in a particular sales role, in your business and industry, selling to your ideal decision-maker, against your competition, with your pricing, sales cycle and challenges. It's all about potential. Growth Potential - how much improvement we can expect from this point forward. Trainable - whether or not the candidate has the incentive to change and adapt. Coachable - whether or not the candidate is open to constructive criticism and believes there is room for improvement. Competency Scores - 8 scores, competencies and tables show both the gaps in each competency as well as the skills that must be developed. 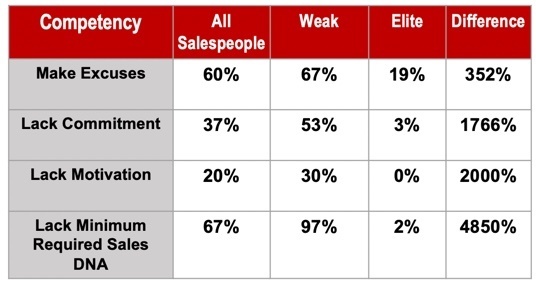 Sales DNA - 6 scores and findings show the gap for each element of Sales DNA and pave the way for improvement. FIOF - the Figure it Out factor shows how quickly a particular candidate will ramp up and begin selling consistently. Compatibility - this shows how compatible a candidate is with your selling environment. The more compatible, the shorter the learning curve. Longevity - this predicts the likelihood of the candidate still being with you at the point in time where they produce a 5X Return on your investment in them. 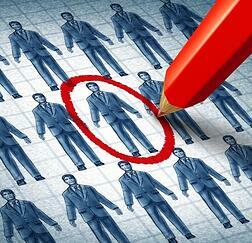 Recommendation - this finding predicts whether or not the candidate will succeed in this role. It's predictive, accurate and lets you know which candidates are worthy of your time throughout the rest of the sales recruiting process. We believe that hiring for potential is smart hiring. But beware, the greater the potential, the longer the wait for results. If you're looking for a candidate to have an immediate impact, you'll want to select a recommended candidate with a lower score on Growth Potential.